Includes use of: 88" SMART Kapp Interactive white board, 80" 4k smart TV w/ computer access, white board, work stations, flip chart easel, 2 breakout rooms. SOD Center Members receive 20% Discount on rental rates. All spaces have access to WiFi, Lounge, Kitchenette and Restrooms. 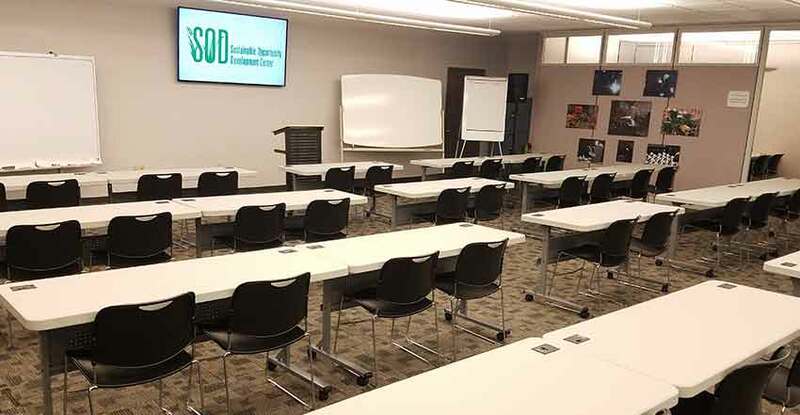 SOD Main Training Area Capacity 70 w/ tables and 100 w/ chairs only Half Day: $175 Full Day: $350 Includes use of: 84" smart board, 80" 4k smart TV w/ computer access, white board, work stations, flip chart easel, 2 breakout rooms. CR Smith Jr. Conference Room Capacity 20 Half Day: $75 Full Day: $150 Includes use of: 84" smart board, 65" 4k smart TV, white board, flip chart easel. Home Savings Training Room Capacity 10 Half Day: $40 Full Day: $80 Includes use of: 4k smart TV, white board, flip chart easel. Church Budget Envelope Training Room Capacity 10 Half Day: $40 Full Day: $80 Includes use of: HDMI projector, screen, white board, flip chart easel.